This knotty, multilayered thriller set near the cusp of the civil rights movement illustrates how crime and punishment in racially segregated Atlanta could be far more complex than relatively simple matters of black and white. Though it has since labeled itself “the city too busy to hate,” Atlanta in 1950, as depicted in Mullen’s follow-up to Darktown (2016), is a grim, wary Southern citadel where racial prejudice is embedded in the local psyche. Since a segregated citizenry is patrolled by a segregated police force, African-American police officers such as straight-laced preacher’s son Lucius Boggs and his more street-wise partner, Tommy Smith, struggle to keep the peace in the volatile, predominantly black community known as Darktown. Meanwhile, Denny Rakestraw, a white policeman who doesn’t like racists but goes along with custom in order to get along with his fellow officers, is able to move his family to a relatively bucolic residential area called Hanford Park, where tensions are rising over its first African-American homeowners. Matters are complicated when the grass-roots drive to force the families out is abetted by local Nazis who are so far to the right, they think the Ku Klux Klan, of which Denny’s brother-in-law Dale is a short-fused, dull-witted member, is too soft on integration. While Hanford Park simmers, Darktown explodes in street fights and shootouts over the distribution and sale of drugs and bootlegged liquor (aka “white lightning”) in the black neighborhood. As disparate as these events seem on the surface, their myriad ramifications intersect, involving the families—and destinies—of all three policemen struggling in different ways to keep the peace. As is the case with such novels, Mullen’s narrative has to contend with the demands of both the mystery and historical fiction genres. The blend isn’t always neatly balanced. 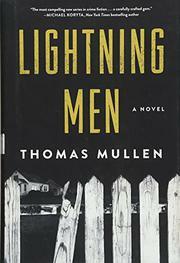 But Mullen proves himself throughout to be a savvy, observant, and empathetic chronicler of a city’s struggle to reconcile its warring impulses with the looming imperatives of social change. This volume, together with its predecessor, suggests strongly that Mullen is working on an epic of mid-20th-century American transformation. If so, the growth of his three protagonists promises to be both fascinating and painful to watch.